The real value of the CFIC Convention is that all the major regional grocery industry companies – retailers, manufacturers, sales agents, logistics providers, suppliers – come together in one place. The CFIC Convention provides a relaxed setting where families can attend and business can still get done! That saves everyone time spent away from the office throughout the year and money in additional travel costs. Sponsors and retailers can schedule meetings to review an established account or introduce a new product, and impromptu pool-side meetings can lead to beneficial, long-term partnerships you never would have expected! Register early! Take advantage of the discounted early bird rate and register by Friday, May 3, 2019. 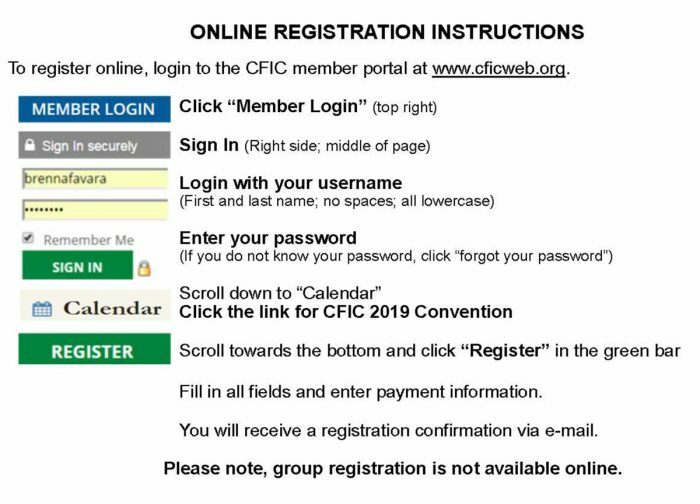 To register, follow the steps below to login to the CFIC member portal. Once you are logged in you can register, update your contact information and browse through the member’s only materials. You can also download a registration form and email it to Brenna Favara at brennaf@cficweb.org. Only registered attendees may attend Convention activities and/or participate in business appointments. CFIC Convention registration fees cover all meals and beverages, as well as access to the CFIC Café, educational seminars, social events, and Tuesday evening children activities. “Spouse/Guest” is defined as one accompanying a registered attendee, but not present for the purpose of conducting business within the retail food industry. Registration is required. Hotel room fees are not included with registration. You must contact the hotel directly for reservations. Early bird registration rate ends Friday, May 3, 2019, and full payment must be received for the rate to be honored. Registrations may be transferred at no charge. Cancellation and registration transfer requests must be made in writing to Brenna Favara at brennaf@cficweb.org, by July 1, 2019. Cancellations received after July 1 will be charged $50 per person. Failure to cancel will negate any refunds and full payment will be expected. On-site registration is strongly discouraged and will require payment in full at check-in. Registration is not valid until a waiver is signed and payment is received in full prior to attending the convention.